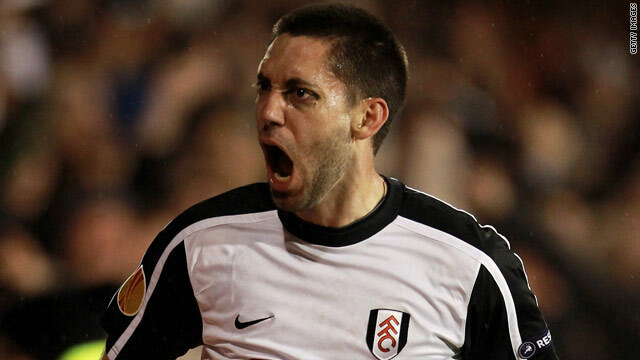 Fulham and United States midfielder Clint Dempsey celebrates his winning goal against Juventus. (CNN) -- English Premier League side Fulham launched a stunning comeback to send two-time European champions Juventus out of the Europa League on Thursday. Fulham trailed 3-1 from the first leg in Turin and made the worst possible start when French striker David Trezeguet scored for the Italian giants after just two minutes. But the home side hit back just seven minutes later when Bobby Zamora outmuscled Fabio Cannavaro to turn home Paul Konchesky's cross. On 25 minutes Fulham's task got a little easier when Cannavaro was sent off for bringing down Zoltan Gera, and 14 minutes later Gera reduced the deficit further when he turned home Simon Davies' cross. Gera then converted a penalty after Diego was adjudged to have handled inside the area before United States international Clint Dempsey sealed Fulham's remarkable comeback with a delicate lob. There was still time for another red card, as Jonathan Zebina kicked out at Damien Duff, meaning Juventus finished the game with nine men. "I just thought 'what the heck' and tried to put it in the far post and it went in," Dempsey said of his goal on ESPN television. "Nine times out of ten you won't make it but sometimes you've got to take the risk. It's great. We showed a lot of heart and character to fight back but we are in the next round." Fulham manager Roy Hodgson told reporters: "I'm on top of the world. I don't know if it is the biggest night in the club's history but it must come close." I don't know if it is the biggest night in the club's history but it must come close. Elsewhere, Liverpool made sure of their passage to the quarterfinals with a 3-0 win over Lille at Anfield. Trailing 1-0 from the first leg Liverpool went through thanks to two goals from Fernando Torres and one from captain Steven Gerrard. Spanish club Valencia went through on away goals after an action packed 4-4 draw with Werder Bremen in Germany. Spain international David Villa netted a hat-trick for Valencia, who were made to endure a nervous final five minutes after Claudio Pizarro levelled the tie 5-5 on aggregate. Belgian champions Anderlecht beat Hamburg 4-3 but the German side made it into the last eight as they ran out 6-5 winners on aggregate. Two goals from Argentina striker Sergio Ageuro helped Atletico Madrid to a 2-2 draw against Sporting Lisbon in Portugal, meaning the Spanish club go through on away goals. Deiudonne Mbokani's goal gave Standard Liege a 1-0 win over Panathinaikos, meaning the Belgian side progressed 4-1 on aggregate. An early goal from Mamadou Niang gave Marseille the perfect start at home to Benfica but the Portuguese side hit back with a last minute Alan Kardec goal to win 2-1 on the night and 3-2 on aggregate. Wolfsburg's tie with Russian side Rubin Kazan went to extra time as they drew 1-1 on the night and were locked 2-2 on aggregate, but Christian Gentner's goal in the 119th minute sent the German champions through. The draw for the quarterfinals will be made on Friday.